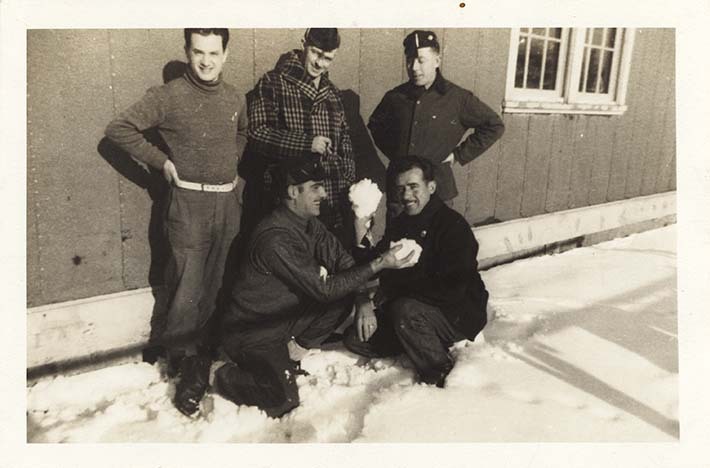 Five internees, with two crouched near the snow-covered ground and in the act of throwing large snowballs. Men are posed in front of a building with one framed window visible. Building seems to be made from studded wood planks. Nello Trasciatti is standing in the middle in the back. Internees were not allowed to have their own cameras in camp. However, it seems that Giacomelli or one of his campmates were able to secure such a camera, as this is clearly an informal photograph. Given the setting and subject, it was unlikley that the official government photographer was involved. The location cannot be confirmed; it is likely either Fredericton Internment Camp or Camp Petawawa. Most of the other pictures in this collection were taken at Fredericton Internment Camp in Fall 1942 or Winter 1942/1943. Although recreational activities were organized during downtime, internees were often lonely and bored. NOTE: there is a duplicate print in the collection (DICEA2011.0001.0020).